There is no better way to celebrate Music Monday than to listen to some new music. What's new for me today is the sound of Laura Stevenson and the Cans. This group has a new CD out called "Sit Resist" and it is free to download for the remainder of this month. I have streamed the CD in its entirety several times over the past couple of days as it has been a wonderful background soundtrack while I work. What I have enjoyed most so far about this group is that their sound is delivered so clearly to the listener. The style and musical pace differ from song to song but you can easily pick out each of the instruments that are highlighted. Not a sound is wasted, drowned out, or backgrounded. Usually a groups sound is almost always clearly defined by the guitar or piano, but this group delivers a musical package of sorts that is never dominated by one specific instrument. This musical package is displayed nicely with the two songs I enjoy most off of this release. The song "Barnacles" differentiates itself with its horn section and then on the next track the banjo sets the locomotive pace of the "Montauk Monster". 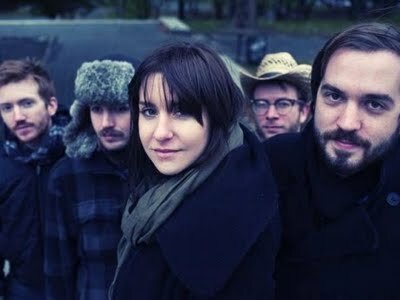 The vocals of Laura Stevenson and her groups instrumental composition provide a wonderful musical mesh that can be appreciated by any fan of aesthetically pleasing sound. "If you like the album, want to support us, and want to encourage more artists to distribute their music for free on the Internet, the best and easiest thing you can do is to simply share this album with your friends right now." Music Sourced could not agree more with this standing and support this group and their efforts. Thank you for this music offering. You can download Laura Stevenson and the Cans first album by clicking the link below. We Welcome Disqus: We Want Your Input!